Are you looking forward to a new comic book but it’s impossible for you to wait for its release before you know what we thought about it? That’s why there’s DoomRocket’s Advanced Reviews—now we assess books you can’t even buy yet. 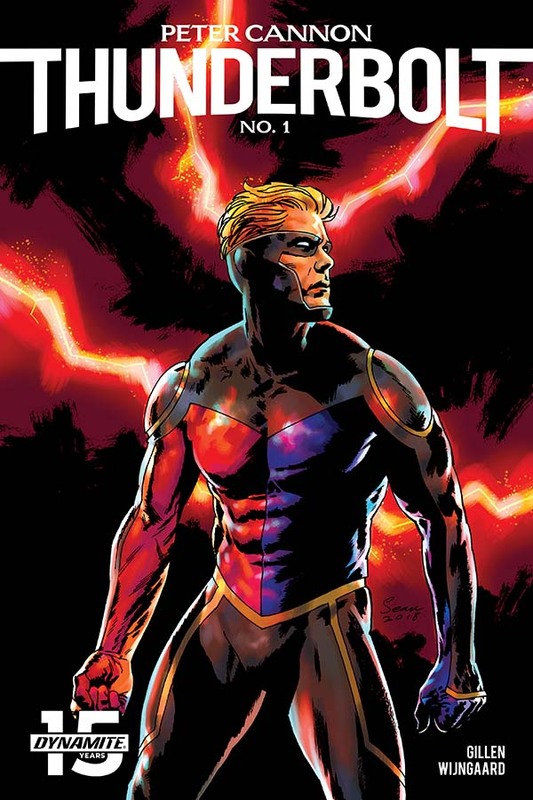 This week: ‘Peter Cannon: Thunderbolt’ #1, out January 30 from Dynamite Entertainment. THIS ADVANCE REVIEW OF ‘PETER CANNON: THUNDERBOLT’ #1 CONTAINS MINOR SPOILERS. by Brendan Hodgdon. As Kieron Gillen leaves the final vestiges of his Marvel period behind him, and his premiere titles Über and The Wicked & The Divine barrel towards their respective finales, it’s time for our finest purveyor of pop bleakness and bad Twitter puns to kick off a new phase of his career. The first step came in the form of last month’s Die at Image Comics, and now, with collaborators (and up-and-coming superstars) Caspar Wijngaard, Mary Safro and Hassan Otsmane-Elhaou, Gillen serves up grade-A fun in a re-tinkering of Dynamite’s Peter Cannon: Thunderbolt. For those unaware, Peter Cannon was a Silver Age character whose original adventures contributed in part to the creation of Alan Moore and Dave Gibbons’ Watchmen, specifically forming a loose basis for that series’ villain, Ozymandias. But while the other Charlton Comics characters who informed portions of that seminal title remained under the control of DC Comics, Cannon returned to the stewardship of his creator Pete Morisi, whose estate has since licensed him to Dynamite. Which brings us back to this quality re-imagining by Gillen and his creative team. And re-imagine they do, to energetic and entertaining effect. Gillen goes broad with the world right off the bat, giving Wijngaard a lot to play with in terms of design. The heroes they assemble around Cannon in this first issue are all packed with personality; their looks are fun and their individual voices are made distinctive and clear. Even the alien invasion that they face is a cool mix of classic flying saucers and more modern alien aesthetics. On this surface level of recognizable tropes and archetypes, Gillen & Wijngaard provide them an engaging specificity. Meanwhile, metatextual maverick Gillen, who knows how the specter of Watchmen will loom over this series one way or the other, seems intent on offering a rejoinder of sorts to Moore & Gibbons’ classic. Gillen’s characterization of Peter Cannon very much echoes Ozymandias as a character weary of society’s faults and dysfunctions. Yet Gillen’s hero is not so misanthropic that he doesn’t see the need to protect people, to safeguard life even as it is corrupted by the nature of the world around it. Ultimately, this Cannon puts aside his disillusionment and chooses to do the right thing, which can’t help but feel like personal reflection on Gillen’s part (given the socio-political backdrop that is our real-life present). It’s a careful blend of bitterness and earnestness that is, among other things, peak Kieron Gillen. But his careful revisionism goes beyond the more famous elements of Thunderbolt’s history, to his beginnings in the Silver Age. Gillen also addresses some of the poorly-aged, problematic elements of Cannon’s origin story directly: He depicts the Far East wisdom and mysticism behind our hero’s genius as a burden of which he doesn’t consider himself worthy, one he lucked into and must actively uphold. It’s not ideal explanation/context but it still offers more consideration than many comparable stories might; it at least attempts to negate the imperialistic hubris inherent in many comparable characters. While Gillen flings about all of this self-aware narrative trickery, Wijngaard does great work. Thunderbolt is another great step forward for the artist following the cult successes of Limbo and Angelic; his style features bold, clean lines and precise framing, which is an ideal fit for a cape-and-cowl book such as this. More to the point, Wijngaard is a great fit for a hero like Thunderbolt, a calculating, masterful combatant, here brought to poised life. Between the panel layouts and careful approach to character design, Wijngaard’s work feels somewhat McKelvie-ish at times, but never to the point that it feels like an aping of Gillen’s most significant creative partner. It certainly makes him a good fit for Gillen’s writing style, as the ultimate cohesion of the issue demonstrates. A big defining element here is how well Wijngaard’s art works with Safro’s colors. There remain some palette choices that implicitly recall Wijngaard’s work on Limbo, but in a more subdued, less neon-heavy context. It helps to give the book a visual aesthetic that feels distinct without becoming distracting or overly stylized. Otsmane-Elhaou’s lettering also works in careful conjunction with Wijngaard’s staging; while there are lots of large splash pages with negative space, Otsmane-Elhaou frames the lettering to help emphasize the emptiness of the panels. It gives the impression that the characters are dwarfed by Cannon, even as he is dwarfed by the (initially) unidentified mystery threat looming behind this seemingly abrupt alien invasion. One issue into Peter Cannon: Thunderbolt and Gillen, Wijngaard et al. are already firing on all cylinders. Resurrecting an often overlooked character, one that inspired a more impactful icon at that, is not an easy task. But there is an ease to how this project fits together that bodes well for the series. It gives us an exciting second chance to appreciate a great Silver Age hero. ‘Peter Cannon: Thunderbolt’ #1 hits stores January 30.